It was designed as an advanced analytical platform for CHNSO elemental analysis and Nitrogen / Protein determination. It is based on an automatic analytical unit whose operation - from sampling up to signal detection - is microprocessor controlled. It represents an evolution in the technique of elemental analysis by "flash combustion/chromatographic separation and multi-detector techniques". Traditionally, automatic instruments for CHNSO elemental analysis have been divided into two groups; micro and macro elemental analysis. 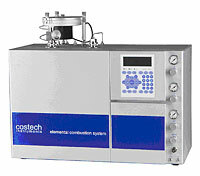 Samples for micro EA are easily analyzed by sophisticated automatic instruments using the technique of combustion/gas chromatography. For the analysis of stable isotopes of CHNSO, a sampling system is required which does not contaminate the sample with atmospheric nitrogen and oxygen, especially working at very low levels. Advanced, highly stable catalysts are required to avoid any material exchange to the combusted gases. To increase throughput and minimize maintenance time and cost, a simple approach to the design of the analyzer is essential, especially for macro sample analysis where all combustion gases pass through the detector system without splitting or diluting. Simple, easy fittings to change tube diameters.